The Gunpla Builders World Cup 2011 is the world cup of Gunpla, or Gundam plastic model building. With entries from countries all over the world, spanning two divisions (one for over-fifteen years-old and there other for under-fourteen), it showcases the most stunning Gunpla in the world. And now, the competition picked the best of the best. 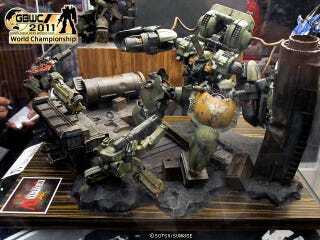 Malaysia took first place for the senior division with a diorama titled "Kshatriya 4" by Ho Yick Yin. You can see it in this post's lead photo. China won the junior division with an entry called "Conversation by Heart" by Lao Jia Hong. It is in gallery's second photo. Congrats to the winners and all the finalists! As Kotaku previously posted, Japan's finalist for the junior division was an eight year-old girl—an unexpected winner in the male-dominated world of Gunpla.